The new European plan to deal with the potential of sovereign default and the increasing doubts about solvency of financial institutions was announced two days ago. Financial markets so far seem to like the plan. The plan did not provide many surprises, it was very much what was expected. Maybe the surprise, to some, is that there was an agreement on the plan. One issue that was debated in the preparation of the plan is how to account for potential losses derived from default on sovereign debt when doing stress tests on banks. 1. No default will ever take place in Italy or Spain. 2. Financial institutions are safe, they have enough capital. But how do you build a capital buffer for banks that convinces markets? By being pessimistic and consider scenarios where things really go wrong. When doing this exercise there is a big difference between losses on sovereign debt and losses on other loans. For other loans one can imagine different macroeconomic scenarios where housing prices or GDP are more or less affected and this leads to a certain % of loans going bad. The disagreement can be on how pessimistic you want to be but conceptually we all understand how the different scenarios are being built. In the current situation, whom you believe is going to determine the fate of some of these governments. If market participants believe Italy or Spain will default then their interest rates will keep increasing and those two governments will not be able to sustain their current debt levels. But if there is trust and interest rates remain low, they have a higher chance of surviving. Expectations are key and both outcomes are possible. If we all become pessimistic we end up in a self-fulfilling crisis. Being pessimistic when doing stress tests on financial institutions is a way to generate confidence. We build a capital buffer that is large enough to deal with any possible crisis. But if you send a pessimistic message about sovereign debt then you cannot achieve the first goal! How do you strike a balance? This is what the Europeans have done: they have built a capital buffer to deal with potential loses derived from default by Spain or Italy. But then they turn around and they tell us that this buffer should not be seen as a validation of the assumption that these countries will default because they will not! "The objective of the capital exercise is to create an exceptional and temporary capital buffer to address current market concerns over sovereign risk. This buffer would explicitly not be designed to cover losses in sovereigns but to provide a reassurance to markets about banks’ ability to withstand a range of shocks and still maintain adequate capital." So this buffer is not designed to cover losses in sovereigns but to provide reassurance to markets. This is a explicit statement that we are dealing with a crisis of confidence and we are trying to combine both optimism (about sovereign debt) with pessimism (when it comes to building a large enough capital buffer) in order to improve the confidence of markets. Not an easy exercise. The role that the Euro plays in the current crisis in European countries is a source of debate. Some see the Euro as the main reason why we find ourselves talking about sovereign default in Europe. Brad DeLong goes as far as saying that "A Greece can only happen to a country that does not control its own currency" (although he knows well that history is full of sovereign defaults of countries that controlled their own currency). Paul Krugman mentions the experiences of Iceland or the UK as examples to Ireland or Greece or Spain where a currency that is allowed to devalue can help GDP grow, which will help making debt sustainable. I will not dispute the theoretical argument that a flexible exchange rate can be a tool to smooth business cycle fluctuations but I fail to see that the data speaks so much against the Euro experience. I can entertain the argument that some of the constraints of the Euro are not helping Europeans to find a solution, but when I look at the data, it is not easy to see a dramatic effect coming from the fact that the exchange rate is not allowed to move. We could compare GDP growth rates but there are too many factors that affect GDP. What if we simple focus on the contribution of exports to GDP? Why exports? Because we normally think about exports as being affected by foreign conditions (which are similar for all these countries) and the real exchange rate. If we were to look at imports then domestic conditions would matter as well and we would have to control for other factors. If the exchange rate is a significant part of the crisis we should expect countries that are constrained by Euro membership to show a worse exports performance than those that let their currencies depreciate. The first chart below plots growth of exports (volume) for Portugal, Greece, Ireland and Spain (countries that are part of the Euro) as well as Sweden and the UK (countries that decided to stay out of the Euro and saw their currencies depreciate during the crisis). 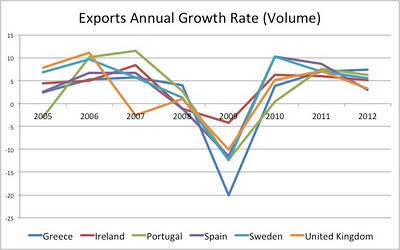 The second one simply aggregates growth rates over time to compare levels of exports where 2005 is equal to 100. It is not easy to see the Euro effect in these pictures. While it is true that Greece is the worst performer and Sweden one of the best in this sample, the same is not true for the other Euro countries. In comparison to the UK, exports growth in Portugal or Spain or Ireland are similar. In addition, if we were to choose 2008 as the starting date, there will be even more similarities in the sample. 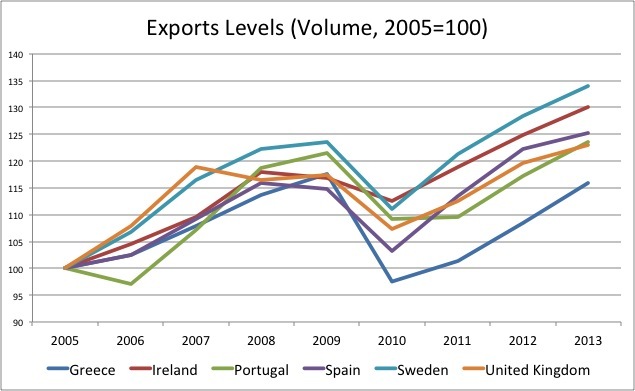 To transform these charts into a proper test I would like to control for the mix of exports of each of these countries but I do not have a strong prior why this should bias the picture in our or another direction. So I remain less pessimistic about the Euro than other econ-bloggers out there. Not that I deny the constraints that a fixed exchange rate introduces but I cannot see as clearly as they do that the Euro is largely to blame for the European crisis. 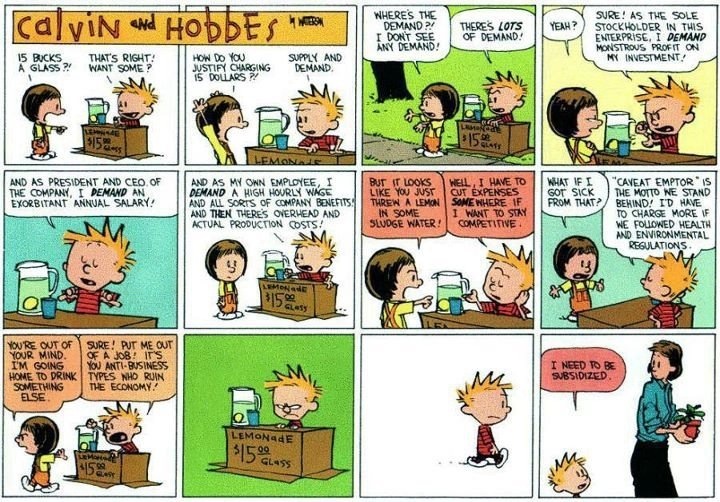 Via James Furbush I see an old cartoon (ten years, some things do not change) from Calvin and Hobbes that explains how bailouts work (click on the picture below for a larger image). 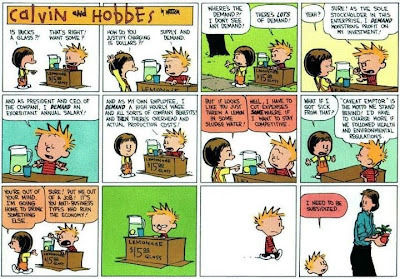 This reminds me of the panel discussion at the Boston Fed conference I attended this week with the title "Will the Federal Reserve be able to serve as a lender of last resort in the next financial crisis". In the panel, Martin Feldstein, Simon Johnson, James Segel and Donald Kohn shared their views on the issue. The unanimous answer to the question was "no". With the introduction of the Dodd-Frank reform and the current political climate, it is impossible to imagine the Federal Reserve doing what they did in 2008 and 2009. From a legal point of view, the Dodd-Frank reform modified the Federal Reserve Act in several ways. In particular, there was section 13(3) that allowed the Federal Reserve to do emergency lending to "individuals or corporations" other than banks. This was the section used for the money that went, for example, to AIG. That section has been modified and now there is no direct lending to an individual or a corporation other than a bank. It has to be part of a program or facility where the individual or corporation participates. So the flexibility is now more limited and it might take time to put such a program in place. In addition, credit cannot be extended to an organization that is failing, only to those that are short of liquidity. This is a good point but how can you tell whether it is a failure or shortage of liquidity. And, finally, many of these steps will require congressional approval. This is a key issue. Given the current political climate, it means that things will have to get much worse than last time before the congress ever approves any necessary funding. Ideally you want to set conditions for crisis and bailouts never to happen. And part of what the Dodd-Frank legislation is doing goes in that direction. But you still need to think about events that will require the central bank to act as lender of last resort. And these events require flexibility but they also require transparency and accountability (in a democracy). But finding the balance between the two is not easy. The discussion in the panel gave me a clear impression that in the US the balance has now tilted too much in the other direction. By reducing the power of the federal reserve to act as a lender of last resort, we do not have the same ammunition as before to handle these crisis. I am all for avoiding bailouts that allow institutions and their managers to benefit from any upside and pass the downside loses to the taxpayers, but we need to be realistic and understand that in some occasions saving failing or illiquid institutions might be necessary. I am spending two days at the Boston Federal Reserve Bank for their annual conference (schedule and papers can be found here). Chairman Ben Bernanke stopped by today and gave a speech to participants about recent monetary policy issues. The press was around so his speech was scripted with very few surprises. It was a nice summary of what we have learned about monetary policy over the last decades: the importance of flexible inflation targeting, the use of balance sheet measures when interest rates are zero, etc Very pedagogical as you would expect from an academic. At the end of the speech I wondered how the press would summarize what he said and, more importantly, how they would choose a headline for the news. He made the job of the press very difficult by giving a very clear and balanced view on monetary policy, no surprises, no shocks. But you need a headline so here is the one from CNBC: "Fed may need to halt future asset bubbles: Bernanke". I am not sure he said that. He did talk about asset bubbles and, to be honest, he did not say anything that was that different from before: monetary policy is not the right tool to deal with asset bubbles but if the other tools do not work, it might be that the central bank has a role to play. Other central bankers probably share the same views (Jean Claude Trichet made similar remarks about a year ago), although there will always be some resistance to use interest rates to stop asset price bubbles -- as a reminder here is a post I wrote about two years ago in response to a paper by Adam Posen, a member of the Monetary Policy Committee of the Bank of England. By the way, here is the video of the speech in case you want to hear his words. 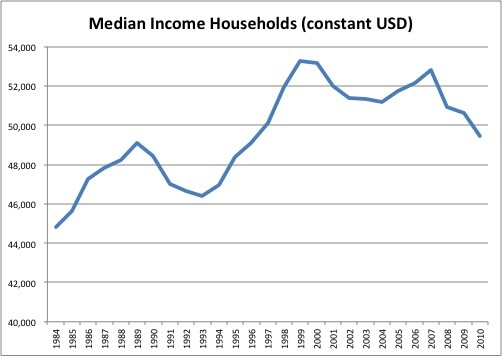 As I am reading the most recent post in Greg Mankiw's Blog, I find the data he presents intriguing. He is comparing two years (2007 and 2010) to show that workers being paid the minimum wage has increased, measured as a % of all workers, from 2.3% to 6%. In those years the federal minimum wage increased from $5.15 to $7.25 in nominal terms. Greg is asking his students to evaluate the link between the two. As one of his former students I feel obliged to look at the data in more detailed to see what I can say. My quick reaction is that there is an automatic relation between increasing the minimum wage and the % of individuals who are paid that wage. If we assume that firms keep employment constant and simply pay the higher wage, this increase will simply be those who were paid in between the old minimum wage and the new minimum wage. There is the possibility that some workers are fired, in which case the increase would be smaller. My second reaction was about the fact that the period 2007-10 is special. Not only we have seen an increase in the minimum wage but also a deep recession. It is possible that some wages have fallen and old employees have been replaced by new ones who are now paid a lower wage - right at the level of the minimum wage. This would also cause an increase in the number of workers paid the minimum wage. But, of course, there is a potential second effect of a recession going in the opposite direction: it can be that during recessions those who lose their jobs are workers that are being paid lower wages and, as a result, you might see the percentage then decreasing as opposed to increasing. So I was curious to see how this figure - the % of workers being paid the minimum wage- has changed over the last business cycles and whether this could also be behind its recent increase. So I plotted three variables from 1979-2010. In blue you see the % of workers paid minimum wage (Greg's variable). 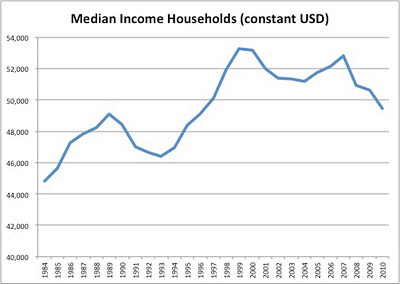 As we can see this percentage has been decreasing since 1979. In that downward trend we also see three spikes: around 1991, around 1997 and 2008-10. The shape of this line, including the spikes correlate very well with the minimum wage (in green). It is measured in real terms (1996 dollars) and the scale is on the right hand side of my chart (the scale does not start at zero to see some meaningful variation). The real minimum wage has also been decreasing since 1979. 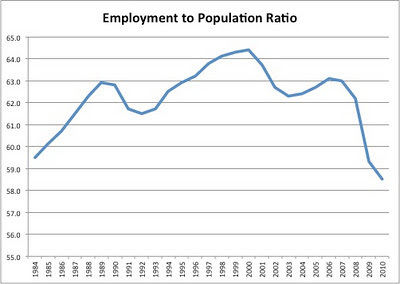 A decrease that has been interrupted with increases in 1991, 1997 and 2007-09. 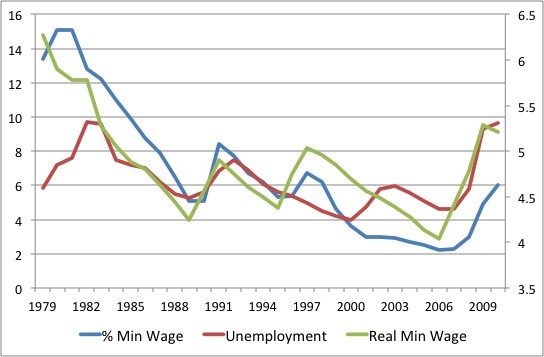 These three increases coincide with the spikes in the blue line, the % of workers being paid the minimum wage. So the mechanical explanation is very visible in the chart, as you raise the minimum wage you see more workers being paid that rate. What about the business cycle or labor market conditions in general? The unemployment rate is in red (left hand side axis). Interestingly, the unemployment rate, or the business cycle more generally, is also correlated with the blue line. Recessions are period where we generally see spikes in the blue line. 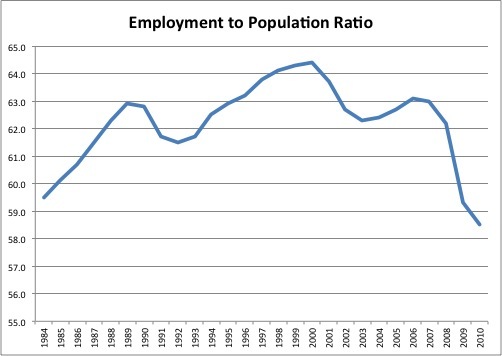 Although there is an exception, the recession of 2001 saw unemployment increase without any change in the % of workers that were paid the minimum wage. The difficulty in the figure above is that there is a correlation between the three variables and it is difficult to establish causality or assess the strength of each of the two effects. Two of the last three increases in minimum wages are not far from recessionary episodes which makes it very difficult to understand the potential role of the business cycle [Yes, there is a possible reading of those episodes as an increase in the minimum wage causing the recessions, but as we know well this is not what led to the 1990 or 2007 recessions]. 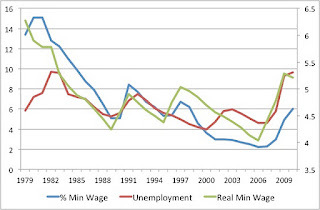 One thing that might tell the two factors apart is to realize that we have an episode of increasing the minimum wage without a recession (1997) and we still see the mechanical effect very clearly; and we also have a recession (2001) without and increase in the minimum wage and the blue line does not change much. So based on that evidence it seems that the business cycle effect is not as visible as the simple mechanical effect of raising the minimum wage. High levels of debt by governments and households are a constraint on how fast demand can grow today. Even if the economic fundamentals (productivity, labor market) were unaffected by the crisis, an environment where everyone wants to save cannot be conducive to growth. Production needs to be sold and for that you need customers. Even those who are not very sympathetic to economic models where demand drives growth understand the difficulties of growing in an environment of debt overhang (here is Martin Feldstein today on the New York Times). Of course, the bank would love to get back the full amount of the loan but given that in many cases individuals can walk away from an underwater home, a reduction in debt is the best the bank can get. In this case we can argue that it is even in the interest of the individual bank to strike this deal, so there is no need for co-ordination. On the one hand it [the debate] sends the signal that a [debt] haircut is more likely, and on the other because the resources for recapitalisation will surely not come from private investors, but rather states would ultimately have to raise the funds themselves, thereby worsening their debt levels. So here we are, in the middle of the negotiation phase. I am sure there is some consensus on why dealing with the debt overhang is good for the economy, now the question is who pays for it. And no one wants to pay for it, so unfortunately there is no consensus there. What is keeping growth in advanced economies from recovering at a speed similar from previous recessions? There are several explanations and which one you prefer might depend on your political taste (see an example of this debate in the US here). There is one potential explanation that I find is being overemphasized: "it is all about uncertainty". And some make it more explicit and talk about regulatory uncertainty, uncertainty about taxes, about a sovereign default in Europe, etc. No doubt that uncertainty plays a role in explaining macroeconomic fluctuations and I am a big fan of Nick Bloom's work, an economist at Stanford, who has provided strong evidence that uncertain raises around some of the most recent recessionary episodes. But what do we mean when we use the word uncertainty to describe the current environment? I believe we are mixing two things: one is that the future is more difficult to predict (and this truly matches the notion of uncertainty) but the second one is that future scenarios are simply worse than what we thought before. This is not uncertainty, this is just bad news. Here is an example: five years ago most investors would not consider the possibility of sovereign default in Europe. Today there is a chance that it might happen. Has uncertainty increased? Yes. There are now two scenarios (default and no default) and we are not certain about which one will happen. But the real problem is that on average the future looks much worse than it used to! So all the uncertainty comes from the left side of the distribution. This is mainly bad news combined with some increase in uncertainty. Same applies to other issues where we currently use the word uncertainty: business face uncertain demand but the real problem is that in the scenarios they are considering, most look bad and they have recently gotten worse; there is increased uncertainty about public finances but the problem is not that we do not know how governments will resolve this challenge, the real problem is that governments have a challenge to resolve! My preference would be to use the word fear rather that the word uncertainty to describe what we are seeing these days. What is really damaging is the possibility of a new recession, the possibility of sovereign default. These are all bad news. On average the future does not look great and this is the real problem.